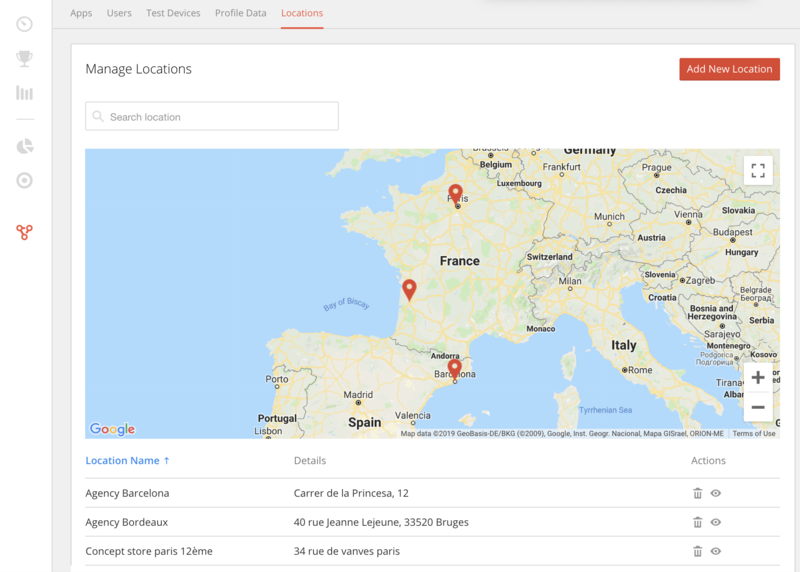 We are happy to announce our new feature Brand Location Management, to allow you to create locations and store lists, and to use it to build segments and to send notifications to those specific users based on their location. 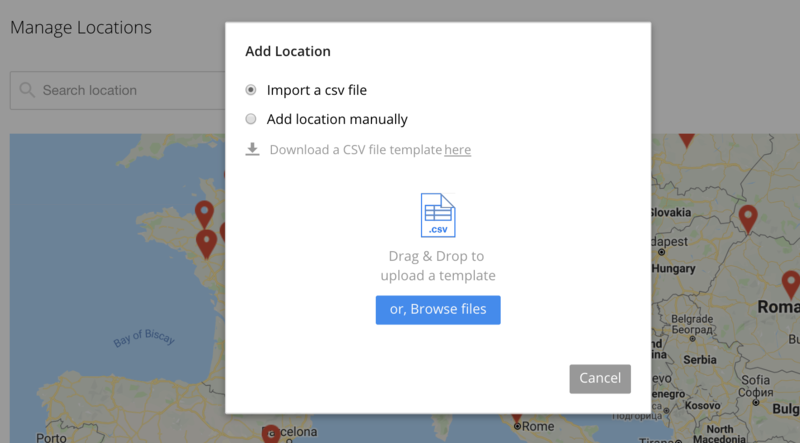 To add a new location, you can either do it manually, by entering all information about the location or by uploading a csv file that contains required information to add locations; location names, coordinates and details. 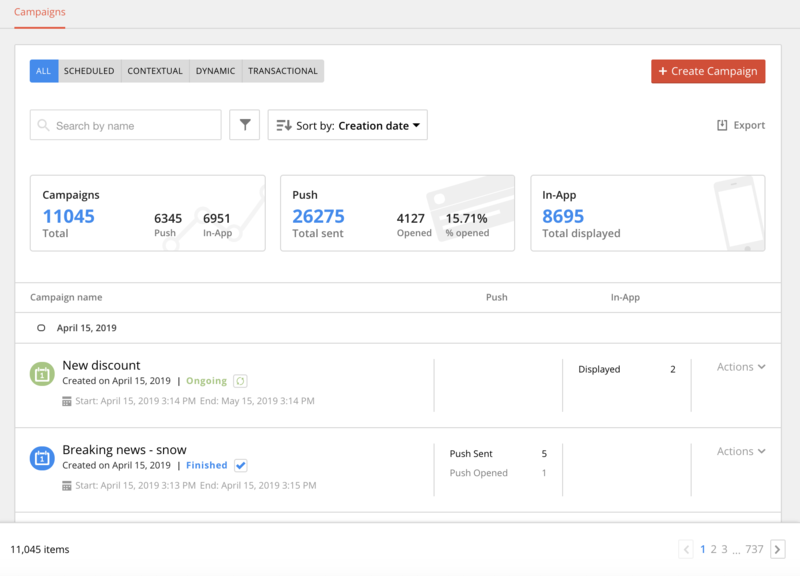 As a first step towards adding cross app analytics feature, we’ve made some changes in the UI of the app picker, to ease the access to app groups and to single apps through search and filtering modules. As a next step for future releases, we will be adding multiple selection to be able to visualise and study analytics of a group of apps. Adding an extra layer of monitoring for campaigns on our end, to ensure more stability. In campaign editor, fixing an issue with tooltip being sticky after clicking on delete button. We've been also working on brand location management feature, specifically on : Permissions, Location creation process, Management of the list of locations and Usage of locations in the filters for campaigns and segments... This feature will be available soon! This is a minor release that brings a new multi-screen default template, available in In-app Library, alongside some improvements and bug fixes. In Administration section, after changing user's details, keep displaying user's page instead of going back to users list page. Display full event name while mousing over events of event flow page. To meet the need of our users willing to save their edited templates, in order to use them later on for other campaigns, we’ve added ‘Save template changes’ action in the editor to save a copy of the template or to overwrite the original template when the user has the permission to manage templates. Edited templates: Templates that has been edited and saved from the editor while creating a campaign. On deep-backend side, there has been a good progress on the new big data ingestion pipeline which, in the future, will help providing near-real-time stats. 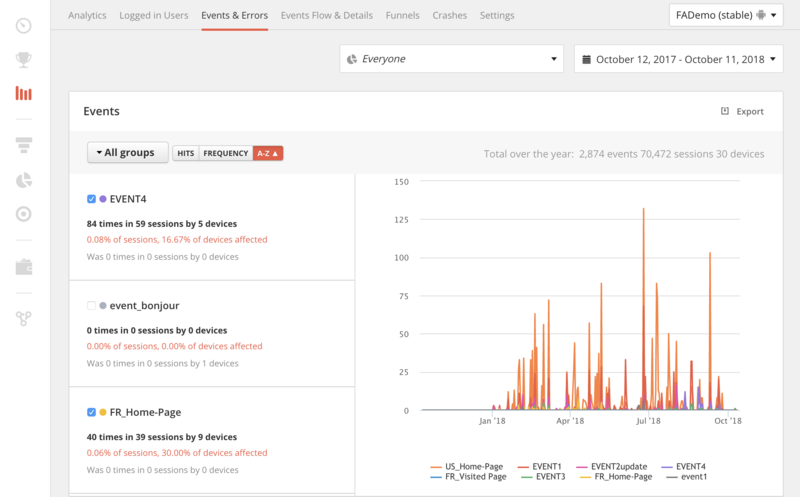 Adding missing labels for devices in analytics page. 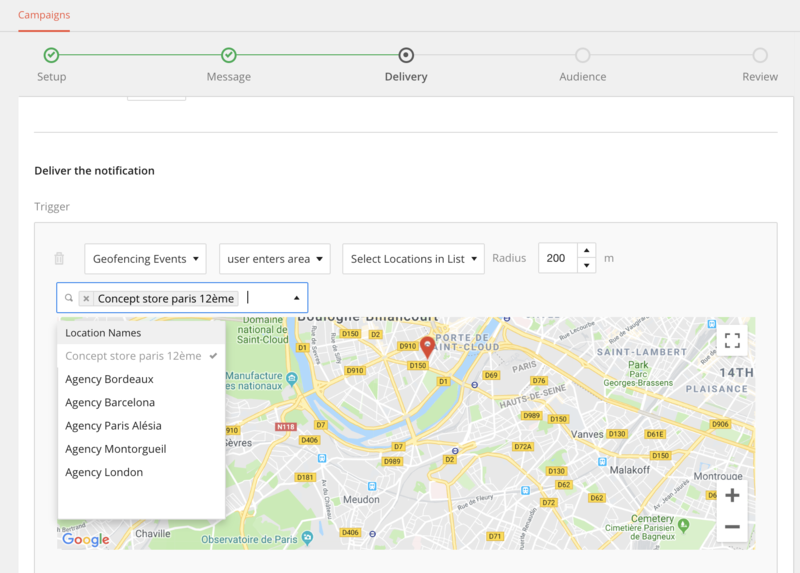 We are currently preparing a new feature for our next release; Brand locations management, to let you add your locations and use them easily in campaigns and segments filters! And there are many other exciting features and updates to come! One image template, that has only one image and a close ‘x’ action. Improving the display of the close 'x' according to device size. On Deep-backend and API side, we've added Optimal Time delivery logic and improved the process of device targeting for broadcast contextual campaigns. 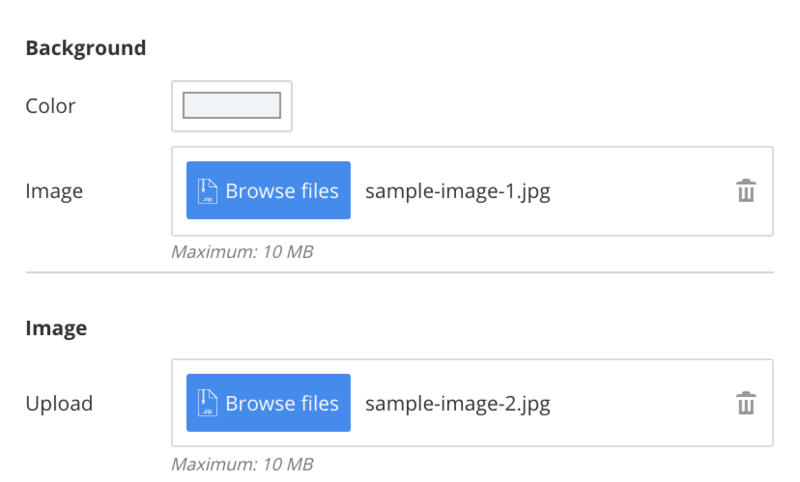 Fixing an Issue with ‘targeted devices’ storage in case of contextual campaigns. A Basic template which has a library of icon, text blocks and custom buttons, so that you do not need any asset on your end. A Custom template which includes images, text blocks and custom buttons. An Interstitial, made up of one image, an action can be configured and applied on the whole area of the image. All those templates are now available in our platform for all users! We propose also a git repository dedicated to default templates: https://github.com/followanalytics/fa-templates. It will keep evolving in the future, with more and more templates for both fullscreen and pop up formats. Feel free to create your own templates by editing these ones! Handling of close ‘X’ in the editor. We are also planning a new feature for the next release, to be make it possible to save the changes made on the template from the editor, in order to have it in the library and use it again if desired. To be precise on opt-in percentages displayed in Segments & Campaigns, we are now updating the population to take into account only active devices, which excludes all devices we detect as uninstalled. This will be visible on segments analytics, segment population will decrease and opt-in percentages will increase significantly. Display a warning while uploading an iOS push certificate when the bundle ID doesn’t match with the one of the app. For User Analytics, we are able to make the export displaying data per day, and only for the selected events from the UI. On the Backend side, we are optimizing the new Kafka pipeline. We have also added monitoring for campaigns, exports and other features. Fixing the behaviour of ‘back’ action after selecting an app from search results list. Some improvements and issue fixes. This release introduces a new UI and UX for a template library, and also a brand-new template schema that offers many customizable parameters. 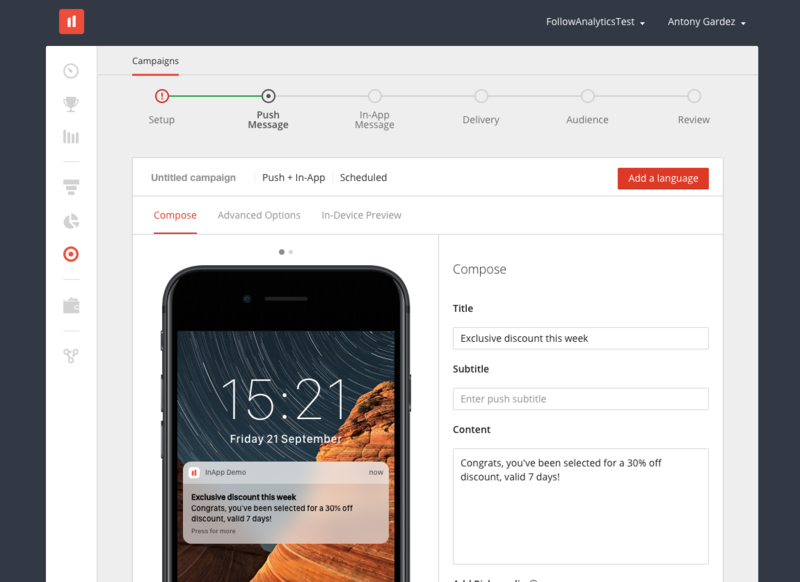 In the ‘Message’ step of in-app campaign creation, the user first chooses a notification layout in the library of templates. The library has a tab for each layout format (pop up and fullscreen for now) and is composed of native layouts, default templates and templates added to the library. While hovering the items of the library, the user can see the device preview, view template information, download or delete added templates when they have template management permission, and also select one to start editing it. The user has also the ability to upload a new template, to use it within the campaign or to share it in the library. This feature is only available for fullscreen format for now, and will be extended to pop up formats as well in future releases. Users who have appropriate permissions can change sharing options of added templates, to make them available only for the current campaign, or to share them within the currently selected app or with all apps. This feature is available while uploading a new template, in the library, editor and review pages through ‘Template info’ pop up. In order to allow platform users to use templates with editable fields that can be customized in the editor page, we are introducing a new templates schema. Therefore, template .zip files include an updated version of the ‘definition.json’, that has different types of ‘input’ parameters, enabling users to define the template fields to display in the editor. A detailed documentation will be available in dev portal in the next release. With the app access management feature, you will be able to fully manage user and team permissions in the FollowAnalytics platform UI. 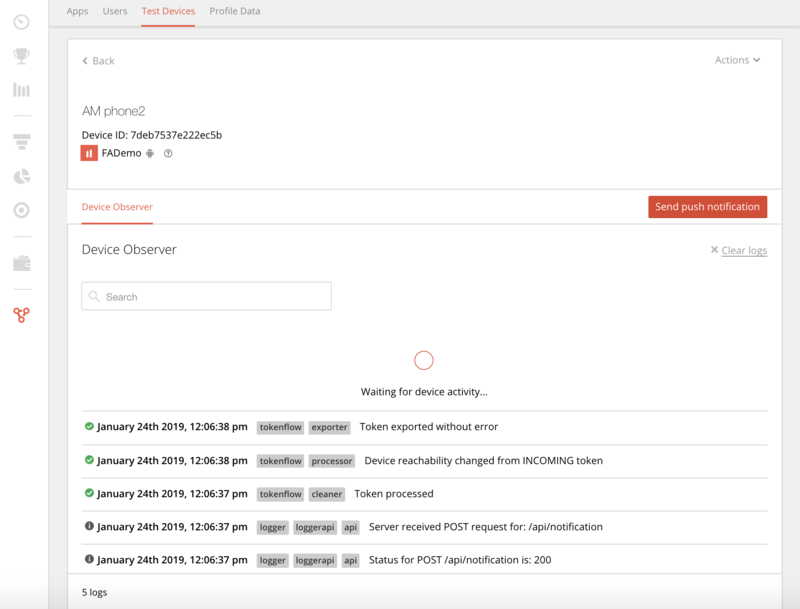 This feature provides a full view of users and teams app access status, and gives you the possibility to override those permissions, and deny or allow app access for all apps, app groups or single apps. Reduce the delay to display AB testing statistics in the frontend. The main fix in this release is to properly manage copy pasting formatted content into fields in the UI. Users permissions were managed by Followanalytics teams so far. In this version, we’ve allowed platform users that are admin to manage those permissions for both platform users and teams. And we continue the work on this feature in the next release to provide also app access management in the UI. 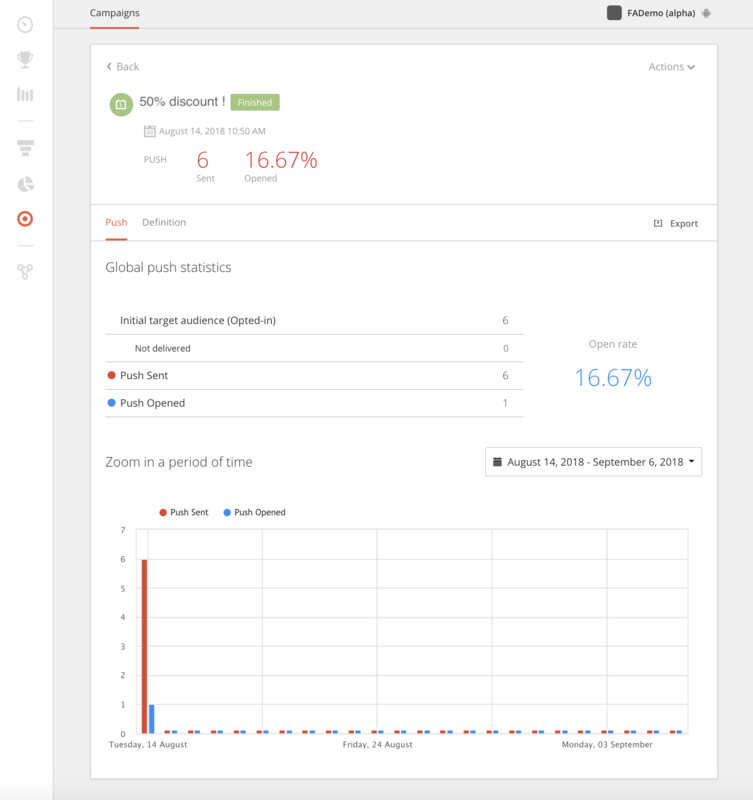 In order to have a better visibility of app and website usage over hours of the day across the days of the week, we’ve added a session heatmap graph to the user analytics dashboard. The heatmap can be filtered by dates and by segments. For some of our clients that have chinese users, it is important to handle separately simplified and traditional chinese users, for better segmentation and campaign targeting. It is important for platform users to know the values of set and string attributes when filtering on them, and to know their distribution over the population. 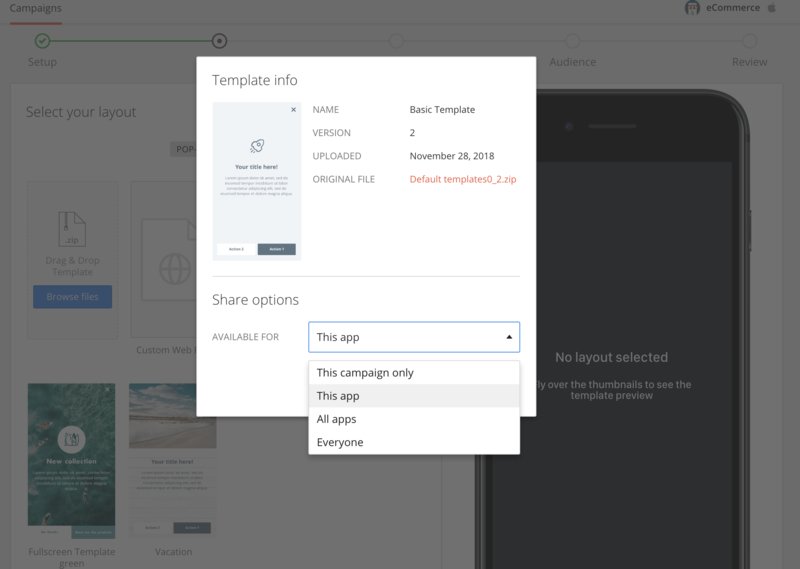 In server release 3.10, we’ve introduced a first step in the In-app templates library & editor feature deployment by updating the Message step in campaign creation flow. In this release, we’ve made a step forward by making it possible - for users with appropriate permissions - to manage template sharing options. We keep up the work to deliver the complete scope in the upcoming releases, including improvements on the library, new templates schema, editor and default templates. Backend: adding attributes to the new kafka pipeline. Improve the creation and update of apple store account when ‘validated’ is set to true. In addition to that, we keep improving analytics pages, campaign exports and we’ve added more granularity in push frequency limitation as part of the administration section. We’ve also continued working on improving the token pipeline, refactoring the backend and fixing platform issues. In addition to sending data access and erasure requests by email to our customers, we are offering in this version a new open API to allow our customers to get the list of data access and erasure requests, received by Followanalytics within the last 7 days. You’ll find all technical information about this API here. As promised in previous releases, segment based analytics feature has been launched on ‘events & errors’ and ‘crashes’ analytics pages. You can simply select a saved segment that has analytics previously enabled, and it will filter the KPIs presented in those analytics pages. To prepare the launching of user permission management in the UI in the next release, we’ve been working on updating the existing permissions model to make them more precise and simple to manage. Before, when setting up a multilingual campaign, we were limited to 5 languages while composing In-app and push messages. In this release, we’ve added a horizontal scrolling system to allow you to add unlimited number of languages in message page. In this version, you have also the possibility to sort the events and errors graphs by alphabetical order in user analytics page. Up to now, as part of app administration options, message frequency limitation could be set to a limit per week or per month, now it becomes possible to set a limit per day as well. Simplify timezone handline in the backoffice. Correctly handle some exceptions in the backend. We are currently building a new In-app template library and editor to offer editable In-app templates to our users. This feature will be available by the end of this year. 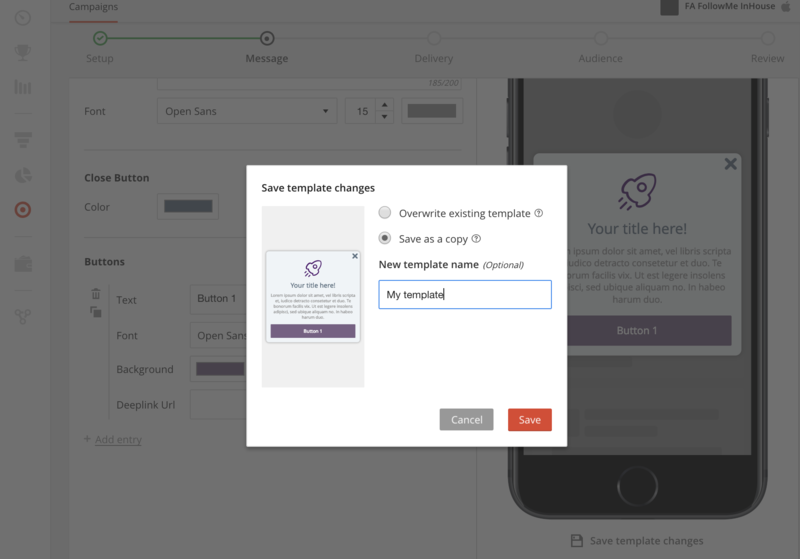 In this release, we’ve started preparing for the In-app template library by updating the message step in campaign creation flow, and also by increasing the width of the interface. This release introduces also an important change in token ingestion pipeline and some improvements in the frontend and backend. To create an In-app message, first you choose either Pop up or Fullscreen format, and then you choose your layout. For Fullscreen format, the layout can be either a web URL or a template to upload. After choosing a layout, it’s always possible to change it using the "Change layout" button. Increasing the width of the platform interface will allow us later to display more templates in the library we are building, besides having more space for template editor items. It also improves the user experience overall the platform. Backend: Replace old token injection pipeline with brand new kafka-based pipeline. 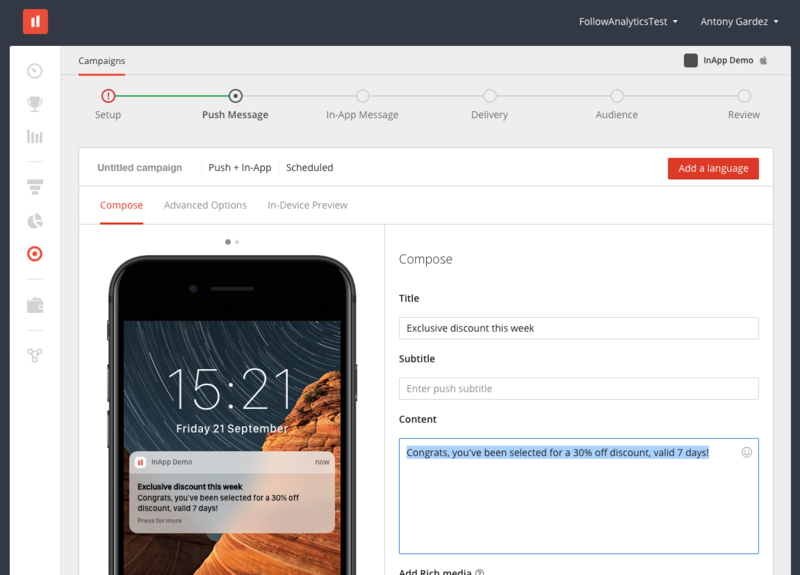 This release introduces a new major feature: Multilingual campaigns. This new version also includes some significant UI changes in campaigns results statistics, besides some important bug fixes related to campaigns, sessions recording and last user-id to be set for devices. With this feature, you will be able to add up to 5 languages while composing your Push and In-app messages. Default language is set by default to your browser language and can be changed easily for your campaign to your convenience. This feature is available for all delivery types and is also compatible with muli-app campaigns. Once all required languages are added, you can review all the messages in Review page and then launch your campaign. In upcoming releases, we are aiming to remove the limitation of the number of languages. We keep improving campaigns section in this release where we propose some UI improvements on campaigns results page. Push and In-app statistics are now splitted in two different tabs. Each statistics page has two main blocks; the first one provides global statistics from Initial audience to push opened or buttons clicks. For contextual campaigns, we enhance relevant statistics such as moment reached, and unless occurrences. The second block provides a zoom in a specific period of time. For AB testing, it allows also to focus only on either the sampling or optimization phase. Fix on sessions occasionally not recorded after aggregation. Revamping of the campaign section continues, with a new header style, improving readability and consistency for quick-view stats. The campaign detail page will be reorganized in the next release. We also improved some of the exports you can get from the interface, as well as fixed a set of issues. FollowAnalytics already provided a first level of analytics for saved segments. This was however limited to a fixed period of days, on limited KPIs. We are introducing the ability to filter your Analytics dashboard page using any of your segments. Simply select an analytics-enabled saved segment from the list at the top of the page to filter all the KPIs given below. In the future, we will roll out this feature to the other tabs of the Analytics section. To be able to use a given segment to filter your KPIs, you need this segment to be saved and configured to compute analytics. To do so, go to your segment in the Segments section and check the Analytics box. Many FollowAnalytics users create campaigns meant to be sent to both their iOS and Android apps. In some cases, similar apps are deployed as separate binaries to the app stores. Thanks to this new product release, you will be able to create your message once and have the FollowAnalytics product create campaigns for up to 3 apps. All delivery types but Contextual are supported. Continuing on our efforts to improve the campaign list and reports, this release introduces a new list item view, also used as the header of the campaign view page. The quick-view stats displayed are better adapted to the type and state of each campaign. open rate columns for messages. The usage export file, exported from the Analytics main dashboard, now contains the break down of app version. Fixed event details report file generation. The campaign workflow gets a revamping for better consistency. The flow for creating campaigns gets refreshed for better readability and consistency. Dynamic: Segment that will be watched to identify new members. Please note that the duration of an in-app campaign is now handled using a "Do not deliver after" parameter located in the Delivery step, under "advanced options". The audience step has been redesigned to make it much easier to select one or multiple saved segments. You can still select custom filtering for one-off targeting. We know setup can be cumbersome. So data elements have been simplified: the list of Follow data is lighter, and when a customer adds external data on a recipient, we suggest items both for easy filling and also to indicate the granularity level. New option to export a policy in XLS format from the history tab, to have it easier to read / review. Identifiers can now have capital letters and start with a number. Data extraction for GDPR data access request now contains an HTML viewer so that the data can be easily browsed (in addition to the JSON file for automated processing). Customers can now provide their own FCM server key, in case you do not use the default Android SDK configuration.